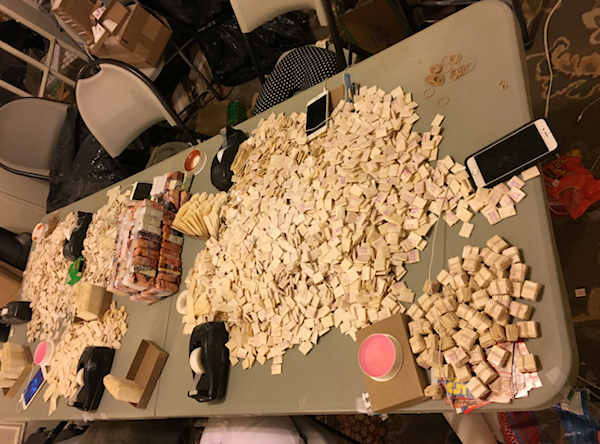 INWOOD, Manhattan (WABC) -- A massive heroin ring was busted in Inwood resulting in more than $5 million in drugs seized and 10 arrests. Approximately 22 lbs. of heroin, including 11 lbs. of powdered heroin and 150,000 individual dose glassine envelopes were seized in a court authorized search of an apartment at 10 Park Terrace East. 10 heroin mill workers were arrested at 7:40 p.m. Thursday. The residential building overlooks the tranquil Bruce Reynolds Garden in Isham Park. When the team of approximately 30 investigators, agents and detectives arrived to conduct the court authorized search Thursday evening, they interrupted the heroin packaging operation in full swing. Mill workers were engaged in processing the heroin and filling tiny bags for retail distribution, with approximately 150,000 glassine envelopes already filled. These were packed into a suitcase and also piled in mounds on a tabletop. Each bag sells for up to $10 in New York City. 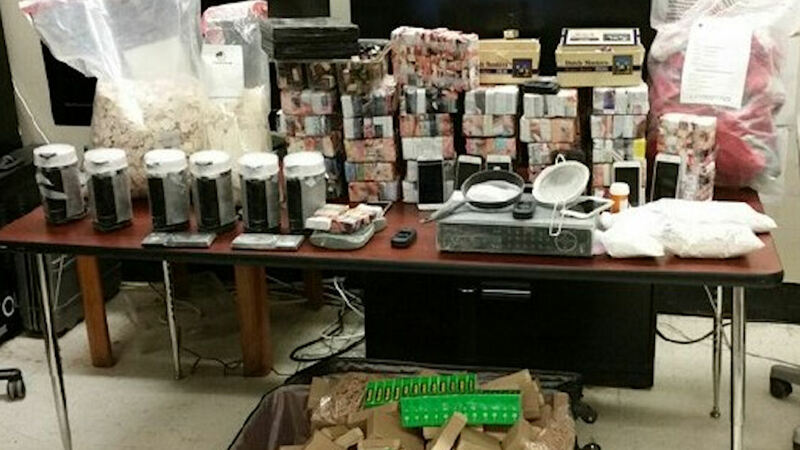 More than a dozen coffee grinders, which are used to mix heroin with diluting agents, were in use. The air was thick with heroin and a powdered layer coated the wall moldings and other surfaces in the apartment. There were also bags of packaging material, scales, face masks, gloves and other equipment, as well as business records compiled by the drug ring. Windows were covered by towels and approximately five window air conditioner units were in use, a hallmark of heroin mills. The apartment was wired with counter-surveillance equipment, including cameras focused on the street in front of the building and the buildings entrance. The operation employed hundreds of stamps in branding the glassine envelopes. 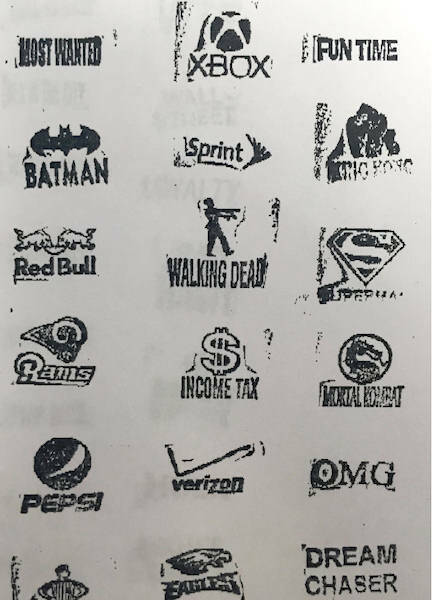 Some of the brand names used were "$INCOME TAX," "FENDI," "PAINKILLER," "BATMAN" and "SUPERMAN." At least one brand was identified as having been sold recently on Long Island. The defendants are charged with criminal possession of a controlled substance in the first and third degrees and criminally using drug paraphernalia in the second degree.